I have ah modified ICOM IC-T7H that puts out as much as 6 watts when powered by 12 volts. I have the ability to transmit on FRS and GMRS @ 6 watts if I really needed to. I would recomend getting two of these radios to modify for longer distance transmissions. Be aware that this is Illegal. With GMRS, repeaters are available and so increase output power but need to be Licensed. how about ExpertPower® 14.4″ Dual Band Two-way Radio Antenna for the UV-5Rplus? The best upgrade you can do is take the test to become a licensed ham radio operator. It’s easy, and ham radios can be inexpensive. Especially the imports from China. You can greatly increase your range over GMRS or FRS radios. Well, as a ham, I recommend Yaesu radios, because chinese radios tend to be less well made, and it might break easily. Ditto to what Roger says. 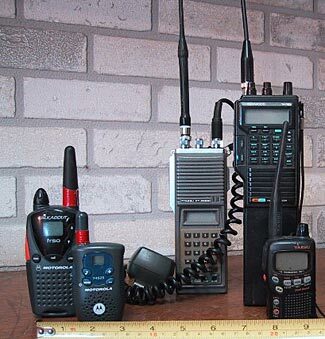 Ham radio handhelds are typically in the 5 watt range compared to the FRS which are usually less than 1 watt. Also ham radio handhelds have more antenna replacement options and possibly can transmit up to 5 or more miles, realistically. Ham radio mobile rigs which can be used in a car or on a power supply in the house can offer up to 50 or more watts which can give up to a 20-30 mile range depending on terrain etc. Bill, you are incorrect. Its not illegal to free band radios to boadcast out of band. It is illegal to broadcast on those bands unless it is a life threatening emergency. David..Thank you for the info. I am a prepper and I’m also about 75% deaf..I can hear some words over the radio but mostly they are unintelligible. Is there a radio of some kind that is “closed captioned”. Sorry this is probably the dumbest question you’ve ever received..but I know how important this is going to be when the shtf. Thanks for writing and your very sensible question. Actually, yes, there are various sorts of radios that would give you the communication capabilities you seek. Certainly Morse code is in some ways the simplest and best, and learning it is surprisingly simple if you’re prepared to take the time. It is the ‘lowest tech’ and longest range method of communicating. Another now less common form is RTTY – radio teletype, where you send typewritten type messages. Then there are a bunch of computer to computer type radio protocols, heck there is even amateur television as well! So there are a lot of ways you can communicate via radio other than simply using a microphone and speaker. The problem is that these technologies are not as common, but Morse remains well supported, particularly in the HF bands, for which you need a General rather than Technician level license. I hope this helps answer your question, and come back with any more questions you might have. Look up “GoTenna” and “Beartooth”. Both are devices which use MURS frequencies (unlicensed VHF, similar to FRS) and allow your phone to send text messages to another similarly equipped phone. For a bit more of a DIY approach, another option would be to use an android app called APRSdroid along with an FRS radio. You’d need to build a proper cable to connect the devices and ideally you’d need a radio with VOX (and it would be illegal technically to send data over FRS frequencies – but perfectly legal on ham frequencies), but this would allow you to send position reports and text messages from your phone via radio. Google “aprsdroid vox” for some examples. Great information, also ole scanners work better with a good antenna, Have had my SportCat -Uniden since late 70’s and picks up all police in my area, DEA,Fire, and even school bus dispatchers..The long and short of it is the rubber 6″ is ok if I’m outside with it on my belt, inside have 22″ high gain works like a champ. Also comes in handy for weather band 164.00mghz/.. Yes, a good antenna is just as important when receiving as when transmitting, and definitely helps any type of scanner. Hope this is of further use to you, too. Don’t forget to get/build a Faraday cage to keep your radios in, just in case. The FRS rules actually REQUIRE that the antenna is not removable, which is why all blister pack radios are like that. A “real” GMRS radio has more flexibility for antennas, like a ham radio, but won’t have the 7 FRS-only channels and will be much more expensive. The Baofengs are down to $30 on Amazon (http://amzn.com/B007H4VT7A/?tag=cgp07-20) – certainly not as user friendly to program or use, and technically not legal on FRS/GMRS/MURS freqs (IMO along the same lines as driving 5 mph over the speed limit), but certainly give a lot more flexibility for an incredible price if you know what you’re doing with them. How would an NA-771 antenna compare than a NA-701? I accidentally ordered this (my fault, typo) and can’t return it. Is it “good enough” or should I buy some NA-701 instead? I’m trying to maximize my FRS to communicate with my brother-in-law roughly a mile away through town. We can mostly hear each other pretty well (better than the stock antennas) with the 771. If 701 is the “best” solution (given these 3 options, stock, 701 or 771) then i’ll order some 701. You can’t replace the antenna on a FRS radio, so the matter is somewhat of a moot point. Furthermore, nothing other than perhaps a free-standing directional antenna on your roof with clear line of sight to your brother-in-law will reliably send a signal one mile through a city. As for which is the better antenna, the longer one is more inconvenient and fragile. Interestingly, both quote the same gain figures. Anecdotally some people report the 771 (the longer one) as being slightly better in terms of range, and I’ve not tested them side by side recently. But neither will give you what you need. Well I should have noted that we’re mainly going to use this for emergencies, (like SHTF), so if the power goes out, we’d coordinate with that until we can get our families together, etc. I have a radio that has removable antenna and have all the FRS/GMRS channels programmed in. I was considering getting a mobile GMRS (with more power) to hook up to a 12v battery, too (don’t worry, I’ll get the license for now, but again this is more for SHTF). Just weighing all my options, but for now just have the hand-helds with the 771. While alkaline cells start out at 1.5v, in most applications they’ll drop to 0.9v before exhaustion. In fact they often cross 1.2v when only about 35% discharged. NiMH cells, on the other hand, quickly drop to 1.25-1.2v in use, but have a mostly flat discharge curve until depleted. So NiMH cells actually have a higher voltage than alkaline cells for two-thirds of their lives, at a 500mA load, for example. Under higher loads, alkaline’s voltage drop occur even sooner, and perform even worse, compared to NiMHs. you can also add a counterpoise ….a length of wire that acts like the other side of the dipole.you can find articles on how to do this. I like the flexible “stealth antenna wire” it is thin and very flexible.